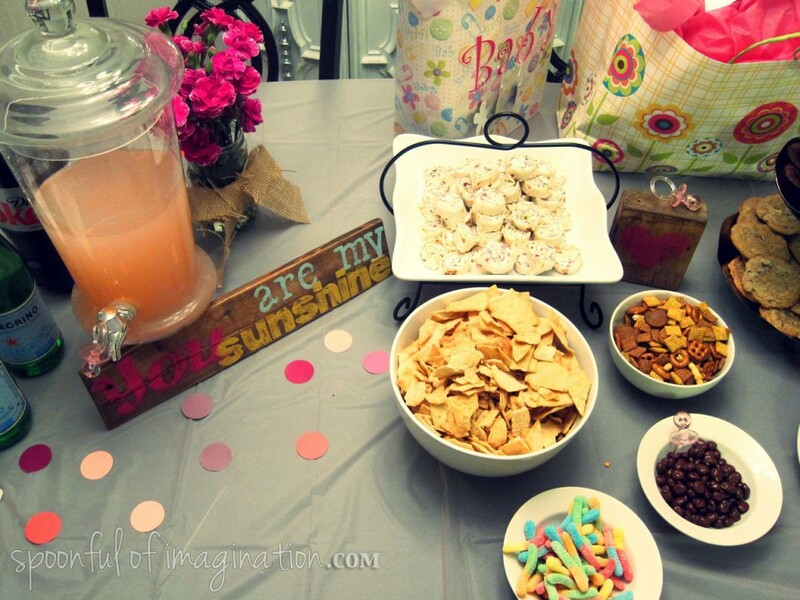 Last week, I showed you some pictures of a baby shower/girl’s night that I threw with DIY on the Cheap. Since that post, I have gotten several comments and questions about the two little vintage wood signs displayed on the food table. I made those as shower decorations, but they also acted as part of Dana’s shower present. Today, I thought I would show you how you can make them, so you can make them too. They were such a cheap way to add a unique touch to our decor and personal touch to her gift. 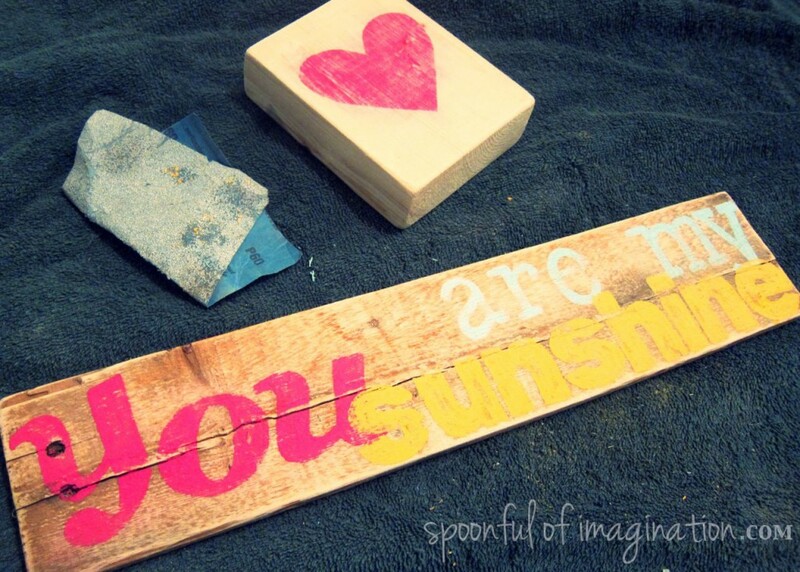 I started by finding two scrap pieces of wood and giving them each a good sanding. I then printed off the words I wanted in fun fonts at sizes I thought that would fit best. The heart block was easy. I just painted a simple heart on it. 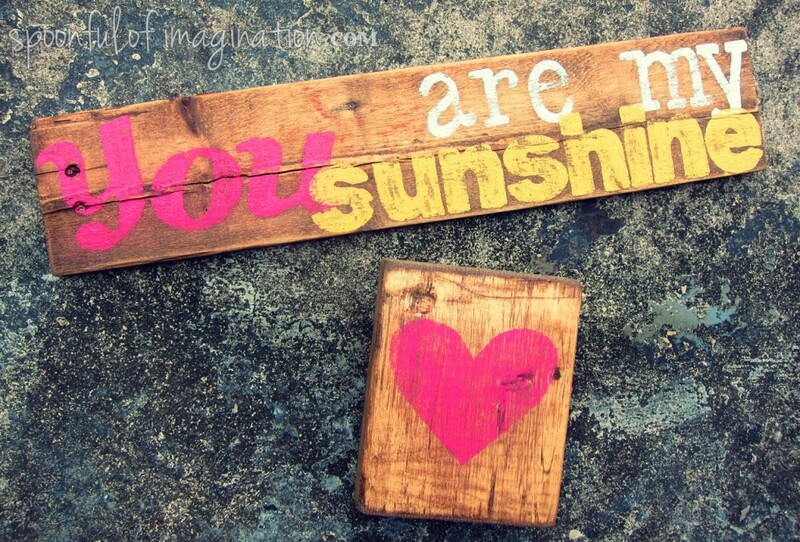 The “you are my sunshine” was a little harder. 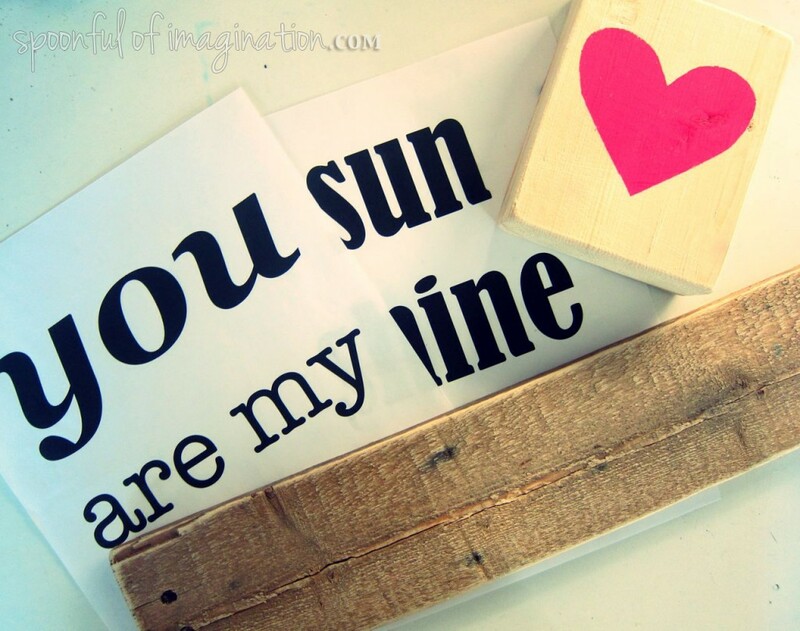 I cut out the letters of “you” and “sunshine” and traced the letters on to my sign. It was a way of making my own stencil. Once I had them in pencil on my piece of wood, I painted them in, and eye-balled the “are my” font and tried to copy it the best I could in paint on my sign as well. My spacing did not come out perfectly, but I think the quirkiness of the design (and over lap of words) adds to its unique charm. 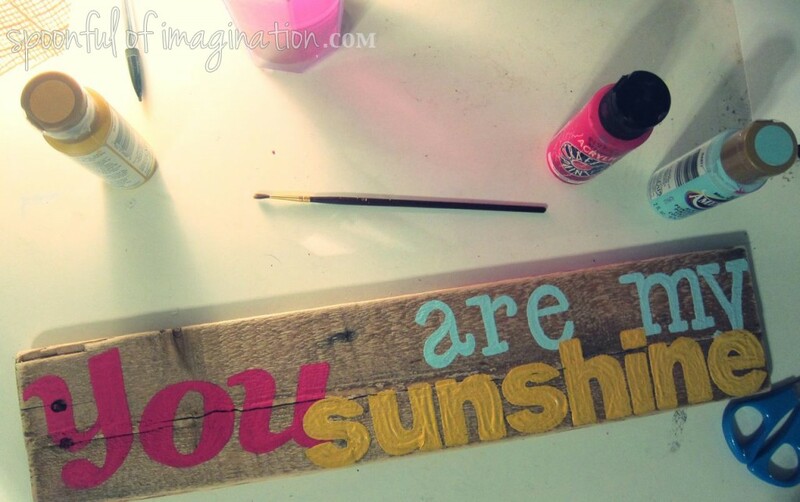 I then gave the wording a good sanding to take away the “raised paint” (as you can see above in the word “sunshine”) and create a more vintage look. I then stained the two pieces. 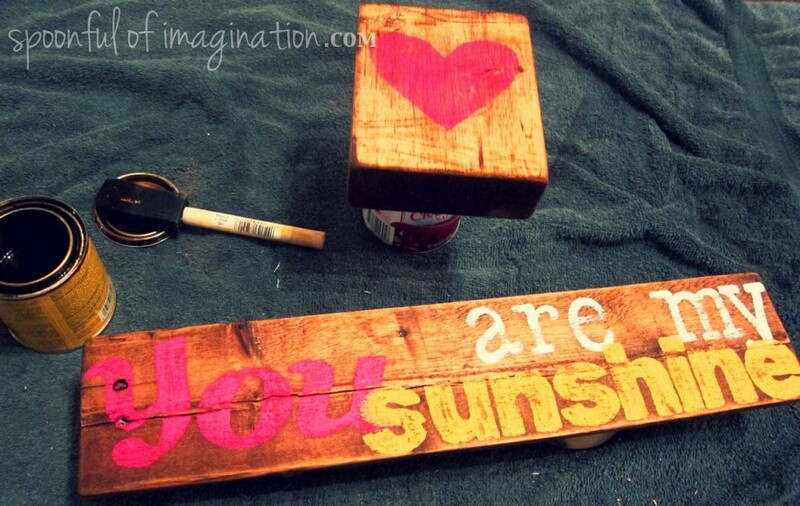 Please read my DIY Stick Heart Wall Art post for more details on how to stain. I think they came out so cute. I almost wanted to keep them. They looked so cute on the food table, and I know Dana was excited about getting them! 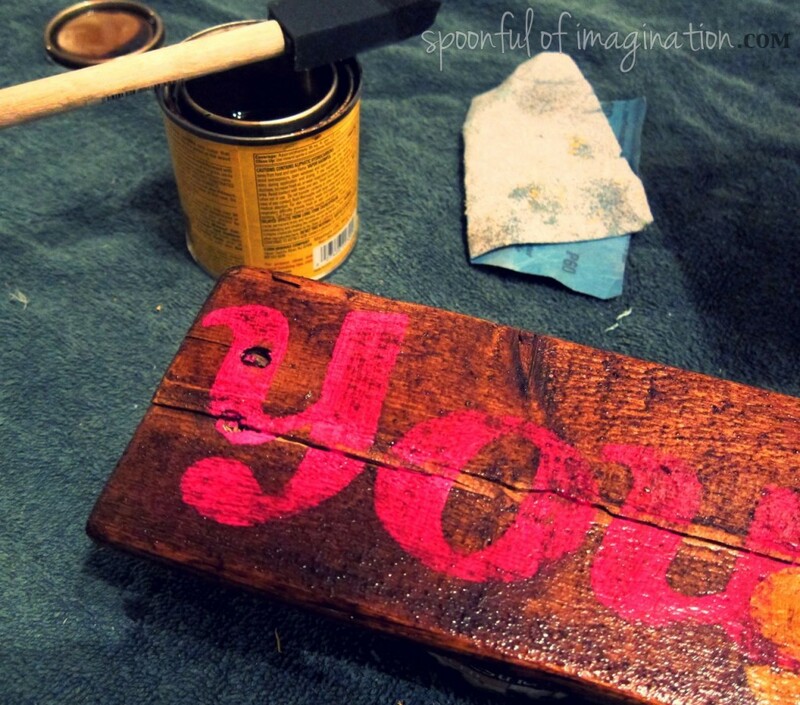 The beauty of this sign technique is you could personalize it with any quote, word, or shape you want! I think it would be really cute for name signs in a bedroom too. I hope you will try this technique, and please let me know if you have any questions! I hope you had a wonderful weekend! Things have gotten crazy busy since my Falling into a Hole post around here. 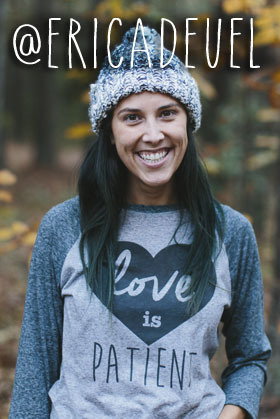 I want to thank you again for all the out pour of love and encouragement to my post on where I am at emotionally. I’m working on an update post, and I hope to get that to you all this week. Thank you for walking this life with me!